I am not a big fan of most coleslaw recipes. I don't like mayo, so any recipe that uses that as a base is a definite no-go, and I don't really care for sugar-y/vinegar based dressing that accompany lots of other coleslaw recipes. 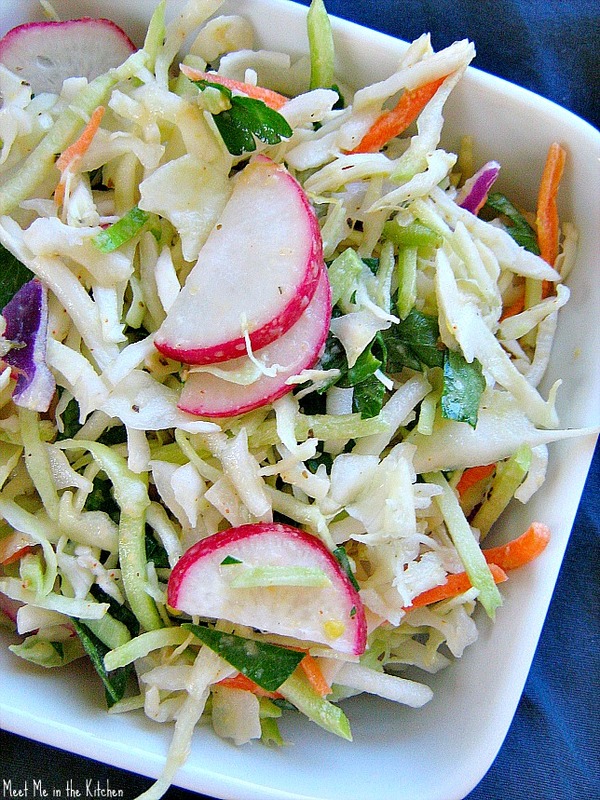 When I saw this simple version of slaw, that is dressed with hummus and lemon juice, I knew it would be something I liked. I ended up just making the slaw part of the recipe and not the chicken part, but I think that the full recipe would probably be really good. This was a great side dish and also made a delicious lunch. I also made this recipe for Roasted Pork with Lentils. from the same issue of Food Network Magazine, but the picture I took was too hideous to share. It was a great dinner. We had collard greens on the side. For the past couple months, I haven't been consuming refined sugars. I will admit that I had a slice of this pie (sans the coconut) that I made on Thanksgiving and tasted a cookie or two over the Christmas Holidays, but for the most part, I haven't been eating it. I haven't been baking very much. I still make my kids cookies or muffins occasionally, but I don't always consume what I make. I also have been experimenting with other ways to enjoy sweet treats. I have seen multiple recipes for Homemade LaraBars and so, I bought a huge bag of dates a few weeks ago. 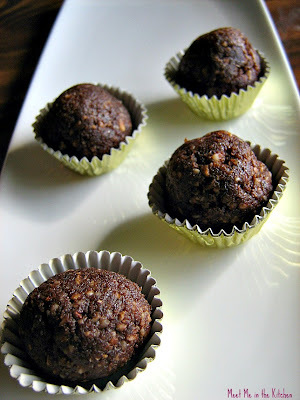 Long story short- These little Date Chocolate Nut Balls were the first thing that I made with my dates. They are kinda like little nuggets of a LaraBar. These little treats are so good. They are just sweet enough to qualify as a treat and the perfect way to top off a meal. I made them when I was taking dinner to someone and kept quite a few for us. We have been enjoying them as snacks straight from the freezer. I worked out the calorie info and each one has about 40 calories. I will be making these over and over again. 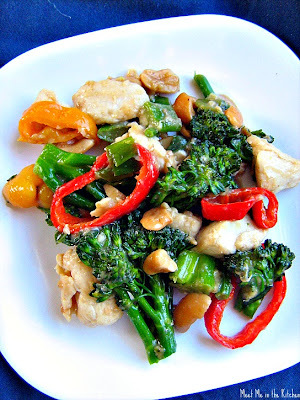 Stir- Fry is always a great option for weeknight dinners around here. I love how quick they are to prepare and also the versatile number of veggies that you can use in them. I saw this fun take on stir-fry in a recent issue of The Food Network Magazine and thought it looked delicious. My kids have been snacking on sweet mini peppers lately, so I had no problem slicing up a few of them for this stir-fry. My family really enjoyed this meal and I hope you do too. 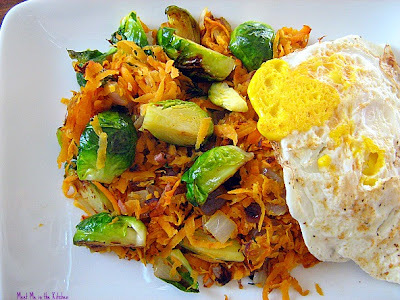 I saw this recipe on facebook and loved the idea of a savory, veggie-filled breakfast. Since now I like sweet potatoes, I was really excited to try this dish. I also love brussel sprouts, so I knew this had to be good. This quick breakfast was delightful. It took a few minutes to prep the vegetables, but once they were ready, the whole thing came together really fast. Because the sweet potatoes are finely shredded/grated, they really don't take that long to cook. I added a fried egg on the side and decided to add this to my weekly breakfast menu. It's fast, nutritious and soo good! My in-laws gave me a gift certificate for my birthday and so over the Holiday break, I took the kids to Barnes & Noble to look at books. I picked up a giant stack of cookbooks, novels, and magazines and parked it in the kids section. Luckily for me, my kids like to look at books as much as I do. We spent a few hours there, but I waited to use my gift certificate, so I could think about what I wanted to get. Before we went to the bookstore I was thinking about dinner and what I could make. I really needed to go get groceries, but decided to use what I had on hand to make dinner instead. 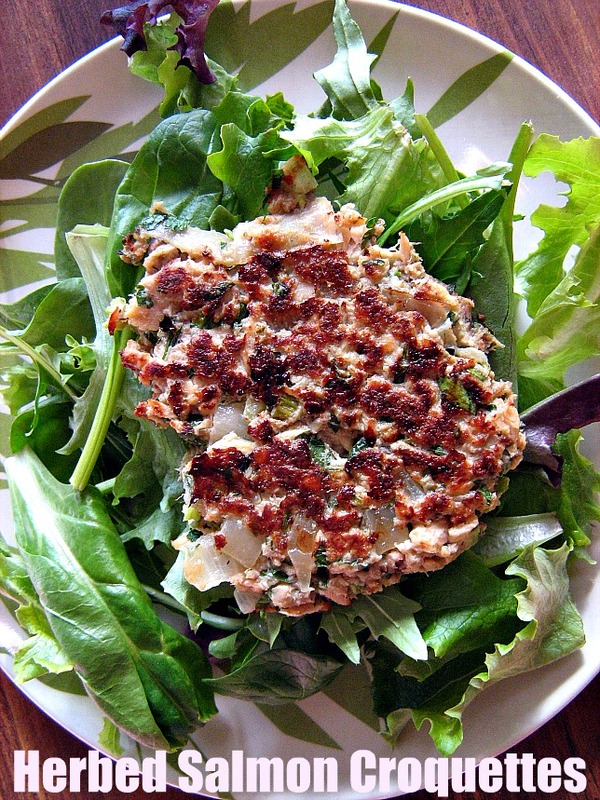 I was thinking about making some sort of salmon patty because I had 2 pouches of salmon in my pantry. While at the bookstore I saw this recipe for Herbed Salmon Croquettes. My past experiences with Ellie Krieger's recipes gave me confidence and I knew they would be fabulous. I have her 2 other books and love them. I had everything on hand and I felt confident that I would be able to find the recipe online. Thankfully, I was able to look inside this book on Amazon and get the recipe. Put the bread in a food processor and process until fine crumbs are formed. There should be about 1 3/4 cups of crumbs. Heat 2 teaspoons of oil in a small skillet over medium heat. Add the onions and saute until soft, about 5 minutes. Add the garlic and cook for 30 seconds. Remove from heat and let cool for about 5 minutes. In a large bowl combine 1 cup of the bread crumbs, the onion mixture, salmon, mustard, celery, egg whites, parsley, dill, salt and pepper, mixing well to combine. Form into eight 2 1/2-inch patties and gently press each patty in the remaining 3/4 cup bread crumbs. Heat the remaining 4 teaspoons olive oil in a large skillet over medium heat. Cook the croquettes until browned on one side, about 3 minutes. Spray the tops with oil spray, flip.. and cook 3 minutes more, or until browned and warmed through. Taking all of this into account, my sister and I started having a green smoothie almost daily. She went back to Utah and we would email or text our different recipes and ideas. I experimented with some of my own concoctions, some were delicious, some not so good-(which I still got drank, somehow). I also tried a bunch of different recipes that used different greens besides spinach, which I am going to share. I haven't taken a picture of every single one of these recipes, but I have enjoyed each of them 5+ times in the past few months. 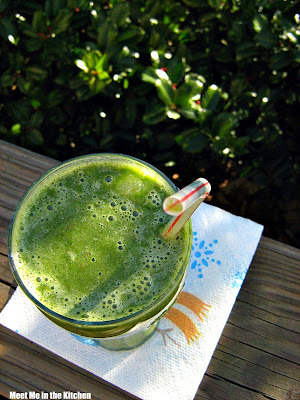 My go-to, on hand, I-don't-want-to-think green smoothie is banana, frozen mixed berries, spinach and cold water. I don't like using yogurt/milk or juice because it adds unnecessary calories, in my opinion. Now I have some sort of green smoothie 3-4 days a week. I find they are very refreshing as an after workout snack/meal, but also are great as a breakfast or snack anytime of day. I don't add any honey/agave/sweetener because I think the fruit makes them sweet enough. My kids drink them with me and really like them. I know many people try to eat healthier as the New Year rolls around and green smoothies are a great and easy way to up the number of veggies/fruits you consume. I have made and enjoyed each of the following Green Smoothie recipes at least 5 or more times. My kids love them too. Rice Krispy Bundt Cake and looking forward to a great 2012! 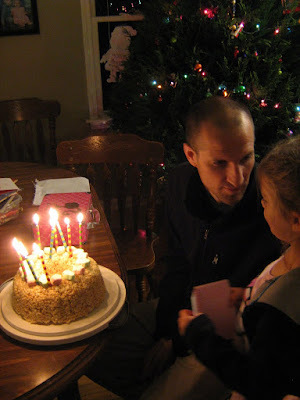 My husband's birthday is on December 23rd and mine is the next day, so our birthdays are usually a busy, fun celebration that involve many Christmas festivities thrown in with the birthday stuff. Neither of us mind this at all. Last year I spent way too much time in the kitchen on Matt's birthday making these totally decadent, divine Chocolate Chip Cookie Dough Cupcakes. This year I wanted to keep it simple and so when I saw Mary post this fun idea for a Rice Krispy Bundt Cake a couple of months ago, I knew it would be the perfect birthday treat for my hubby. One of his fave treats happen to be rice krispy treats, so he was very excited. The preparation was easy. 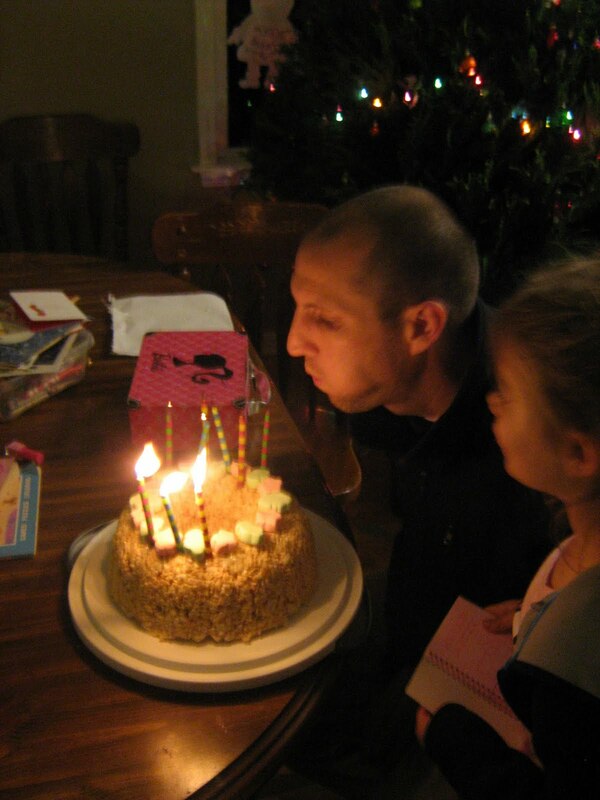 The celebration was simple and there was absolutely nothing fussy about this fun birthday treat. We decorated the top with Christmas shaped marshmallows and each enjoyed a slice after going to a basketball game. I am excited about 2012. I think it is going to be a great year. I am looking forward to fun, challenges, growth, excitement, laughter, hard work and much more. I'm not sure what exactly that means for my blog, but I have made some changes to my diet over the past 2 1/2 months and I don't know for sure how that is going to translate to what goes on over here. On another note, I saw this Food Lover's Cleanse on Bon Appetit last year and really wanted to try it. I am thinking about starting it within the next day or two, but I'm pretty sure the only part I will include my family in is the dinner portion. Maybe I will choose the best 7 days of it and do it for only a week. I hope you all had a great holiday and are as excited about the new year as I am!